Christmas Cards, Place Cards, Gift Tags and more! When a formal invitation is needed, why buy them? Computer programs not formal enough? When I am planned my two son's Bar Mitzvahs, I tried to add our love of crafts and making Judiaca into the planning. We made a lot of the decorations, ritual items (see my make your own ritual wear pages) etc. We had a GREAT time. We needed a second heat gun as his brother (then 10) wanted to help and so did I. Why should they have all the fun! Of course we have to consider the safety issues as you can get burned or burn a surface with this gun. We worked carefully and had the gun always on a metal surface to not burn anything when we put it down. EMBOSSING IS REALLY FUN AND EASY! We used a computer for the text for Micah's Aug. 24 Bar Mitzvah. He did use an embossing pen and clear embossing for his invitition. We really liked using the clear embossing. Embossing using Rubber Stamps, Calligraphy Embossing Pens and more! I had never used a heating gun before. I found two at a local store. Darice and Marvey. I went with the Marvey as it looked shorter for a teen to use. I later got a Darice at a yard sale it was great too. I am still experimenting. I knew we would mostly want gold for the formal look for the invitations, but bought blue too. 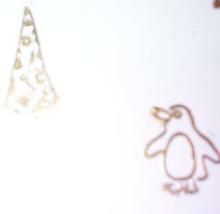 I have since learned that if you want the embossing to really show you need to use pigment inks. I didn't. I found a great roll on embossing liquid. You can roll directly on the rubber stamp with no need to use an ink pad. Quicker when doing many. We discovered that the stamp can be used a few times with out re-inking as the ink dries very slow. You stamp the design, sprinkle powder on, fold paper slightly to dump excess off or use a thin brush to gently brush off excess. Heat with gun quickly moving the gun. It is done in seconds. Some tools and supplies you might need depending on your project. 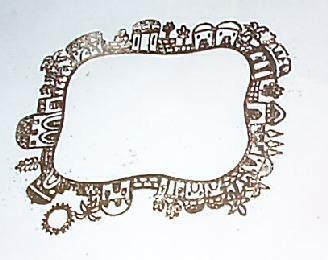 Large Rubber Stamp rubber surface (Darice) pad to use under your paper. Nice surface has a little give that helps with stamping. Embossing Ink Roll On or Pad. Metal tray to rest the heat gun. 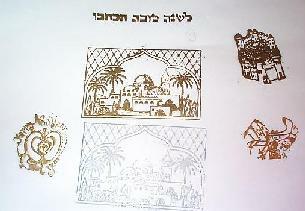 Most of the rubber stamps used in these examples are from the Zum Gali Gali Company. 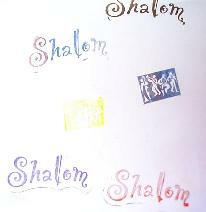 See my Jewish Resource Pages for the link to their site. 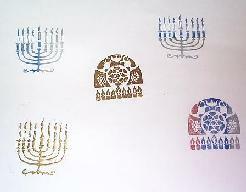 They offer many Jewish stamps but they also offer other stamps. We had Ronin Caligraphy the invitations to the Temple and type the rest on our computer to be copied at a Xerox store on different color and thickness of papers depending on what part of the invitition package. We had him write large and then I shrunk it at the machine. We copied it four times on a sheet leaving room blank at the top for the rubber stamping later. We learned with Micah's that if you bring it to a store to have it printed on card stock, make sure to tell them you want it to be off center. They thought they were helping me by centering what they thought was a mistake. I had to have them do it again. For our Bar Mitzvah, we have many different events. Every Synagogue or Temple has different customs and rules. We have the Friday night welcoming Shabbat Evening Service with a dessert reception. Saturday morning full service followed by a luncheon for all that attend the service. Ours will be simple but we are required to invite the 500 family members in addition to our guests. We are estimating about 150 to 200 people for lunch. Ours will we a simple lunchen I will be cooking before hand myself. Some people have offered to help. Some make this simple, others hire a caterer. Option afternoon or evening party. This can be a family only party, birthday party with children only or as fancy as a huge wedding. It is up to the family and their budget.Ours will be his friends and our out of town guests but by Saturday night I will need help so a caterer is helping. With the rules of Shabbat and what you can or can not do I will not be able to cook for two different functions in two different towns. For some multiple events the invitations can be complicated. Here are some of the possibilities of what is needed in your envelope. Invitation to the Evening Party or separate reception. If there are people that you are not inviting to other party. Directions to the Temple etc. and any special instructions. Again you may need two if you are not inviting everyone to everything. Hotel Information, airport info, car rental etc. Suggestions to fun things they can do in your area if they come for a longer time. Dress code or rules are helpful either on the invitation or on this seperate sheet. List any special rules for the event. List and special religious rules for the event which can differ for each Temple. Other events can also have rules that are unfamiliar to your guests even for Christian and other religious events. It helps your guest be more comfortable. You can list for example that no items are to be carried into the Temple. 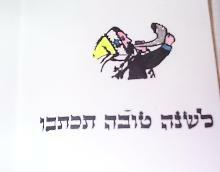 We are forbidden to carry on Shabbat. So if people want to give the boy/girl, bride groom etc a gift, it should be mailed or given at a different time. People can bring them to reception but it is tacky to tell them. All Men (Jewish or not) and for our Temple and most women cover their heads. Yarmulkas are provided but some women may wear hats. All Jewish Men should wear prayer shawls for Saturday's service. Jewish Women at our Temple can and often also wear them. Most Temples will require all that go up onto the Bima, the stage like area where the service leaders stand, will wear prayer shawls, tallit when they are called up for this "honor". There are parts of the service that non-Jews can help with but non Jews do not wear prayer shawls/tallits. But headcovering is expected at least for the men. Tell them if it is required for the women too. Some only require married women. Many Temples have a sheet or booklet at the door that explains the rules. But it is often too late for guests to know these things as they don't read the booklet until they are seated inside the chapel. I also like to explain the custom of throwing candy or something sweet at a wedding or bar mitzvah. That it is symbol for the person or couple to start their new life with sweetness. Candy is provided during the service. (I suggest finding soft candy as it can hurt!... Tricky with Kosher events but Sunkist makes a soft jelly wrapped candy that is Kosher. It is sold at many warehouse clubs.) Also the candy will be passed out during service for them to throw. Children often help with this and it helps if guest know this is not a strange gift for them to eat in the middle of the service. Also prepare the guests that often children are allowed to run up and grab the candy off the floor for them to eat later. A fun and crazy few minutes! They also have a store. Suze Weinberg, Schmooze with Suze - Rubber Stamping Resources. Rubber stamping resources for the BEST! She has her on line of embossing products which you can buy here or at other online stores. Her gallery of embossed products for rubber stamping for scrapbooking, jewelry and more are incredible. Check out her lessons and techniques. Examples: of different stamps and pens we may be using on different sheets. These were our practice/learning examples. We have not decided this may be used on the thank you cards. But looked great for the Wood Family to have in our collection. Small Band stamp for our party invites. Used a Caligraphy Emboss Marker to write his name in Hebrew. Trial of regular blue ink pad, clear emboss ink using clear/irridescent powder instead of gold. Stencil with Embossing roller ink, pen and gold powder. Just curious if we could do it. We used a pigment ink pad that had three colors. Blue, Silver and Gold. The way you positioned your stamp on the ink pad gave you different inks in different spots. Clear embossing powder was used with the color inks. More examples of the use of different inks. 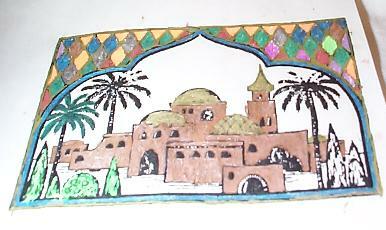 Before we knew how to emboss, we stamped with gold or black ink and colored the picture using gel pens. To see pictures of my son Ronin's invitation and other crafts we made for his Bar Mitzvah see: Ronin Wood's Bar Mitzvah album. 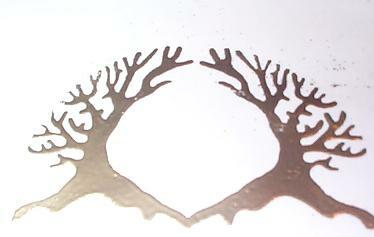 I am fascintated with the thick UTEE embossing powder projects as see on TV with Suze Weinberg. I am hoping to add some lessons and projects in the next few months. Many more products about UTEE at Joann.com!